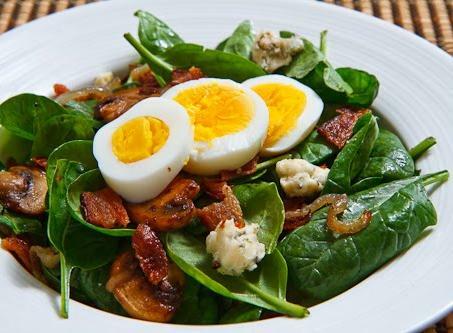 Egg and Spinach Salad is delicious, speedy to cook and nutritious side dish for veggie lovers. Spinach is the main ingredient of the salad which not only provides you with an amazing taste but also boosts your cardiovascular health, lowering the risk of age-related illness. It is the main source of lutein, magnesium, folate, riboflavin and vitamin. Freshly picked spinach leaves are the key to the best taste of Egg and Spinach Salad. The egg, on the other hand, is the second main ingredient of the salad which is useful against breast cancer, eye diseases and which improves hair and nails. If you want to make this nutritious salad at home, then read the simple steps given below and enjoy. First of all, wash the baby spinach and cut their leaves into small pieces, equal to 4 cups. Place the spinach in the salad bowls. Top the spinach with 1/4 thinly sliced red onion. Mix all the ingredients in the bowls and set them aside for some time. Meanwhile, take a medium serving bowl and add 2 tablespoons of extra-virgin olive oil, 1 tablespoon of apple cider vinegar, 2 teaspoons of mustard, 1/4 teaspoon of paprika, 1 pinch salt, 1 pinch pepper, and 1 pinch sugar into it. Whisk all the ingredients in the medium serving bowl until mixed well and smooth. Now, add it to the spinach-onion mixture in the serving bowls and toss to coat properly. At the moment, set the serving bowls aside and boil the eggs perfectly. Slice the eggs into pieces. Garnish the salad in the serving bowls with the egg slices and serve.